Do smoke-free stoves really save lives? A big clinical trial in Malawi was expected to show children are less likely to die of pneumonia if they live in a home where food is cooked on a smoke-free stove rather than an open fire. Instead it suggests the stove makes no difference. Where does this leave a huge UN-backed project to get 100 million clean cookstoves into homes in the developing world by 2020? "Exposure to household air pollution is a problem of poverty," says Kevin Mortimer, a medical doctor and a respiratory health researcher at the Liverpool School of Tropical Medicine. "If you're not poor, you're not exposed." About 2.8 billion people - between a third and a half of the world's population - burn solid fuel such as wood, crop waste, charcoal, coal and dung to cook their food in open fires and leaky stoves. Inside those homes, cooking smoke is eye-stingingly visible, and it blackens the walls. But the invisible effect it has on the tiniest, branching airways of the lungs is what makes this a global crisis. Those smoke particles are taken up by cells that form part of the natural defences of the lungs. In doing that, they diminish the function of these cells, increasing the risk of infections and chronic illness. Crucially, smoke is a key driver of child pneumonia - a leading cause of death in children under five in many countries across the developing world. The World Health Organization (WHO) estimates that four million premature deaths every year - in children and adults - can be attributed to indoor air pollution. That is why in 2010, the United Nations Foundation and the US State Department launched the Global Alliance for Clean Cookstoves (GACC), with a mission to "foster the adoption of clean cookstoves and fuels in 100 million households by 2020". 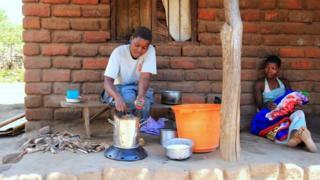 Cleaner cookstoves, the alliance says "save lives and reduce illness". There is, however, a problem. A study run by Kevin Mortimer in Malawi over the last two years, and written up in the Lancet, shows that the cookstove alone does neither. Mortimer and his colleagues targeted 150 villages in two of Malawi's poorest districts, Chikwawa and Chilumba, giving a cookstove to half of the families, and using the other half - who continued to cook over an open fire - as a control group. The health of children in both groups was tested regularly. "We followed up and monitored the health of 10,000 children for this study, and our results basically show that there is no difference in cases of pneumonia between the intervention and the control group," he says. "The hard science - certainly from our study - is perhaps at odds with the claim that stoves along the lines of the ones we've used here save lives and reduce illness." The stove used in the trial, distributed free of charge to just over 4,000 homes, runs on the same fuel as would previously have been used on open fires but incorporates a battery-powered fan to blow air through a contained furnace, resulting in a more efficient, less smoky fire. Mortimer was expecting, and hoping, that the reduction in smoke would lead to a reduction in pneumonia. He only got the bad news right at the end, because the data had been "blinded" - the researchers deliberately kept hidden whether a given set of medical records were from a family who had been given a stove, or from a family in the control group. "I would have really, really loved to have seen that this intervention was a clear, beneficial intervention for children under the age of five," says Mortimer. "So that moment of unblinding the data and seeing that there is no measurable effect at all… certainly it's disappointing, but I do think it's the truth. "On the one hand, I'm satisfied that we did what we set out to do - we answered the scientific question clearly. But there's the human reaction to that." Mortimer's results come on top of studies carried out in Nepal by Prof Jim Tielsch from George Washington University, to assess whether cleaner stoves significantly reduce the amount of pollution that people breathe in. "Where we work, right on the border of Northern India, the predominant source of cooking fuel is biomass fuel - wood, dried animal dung, often mixed with rice straw and crop waste," he says. This results in concentrations of breathable particulates between 900 and 1,400 micrograms per cubic metre - way above the 200 microgram level rated as "very unhealthy" by the US Environmental Protection Agency's Air Quality Index. The first of Tielsch's two randomised trials used an improved biomass stove with two burners plus a chimney to vent the smoke outside. The next used a stove running on liquefied petroleum gas (LPG). "With the first stove intervention, we brought [exposure] down to about 900 from 1,400 micrograms. And the LPG stove brought that down by another 50%," he says. "That's substantial, but nowhere near what was needed to have an effect on respiratory health." His conclusion: "We need to focus on cleaner fuels, and - for young children - on better nutrition and vaccinations against diseases like pneumonia." Prof Majid Ezzati from Imperial College London, who has written an editorial in the Lancet to accompany the findings of Mortimer's team, also says it is now clear that stoves are not the answer, and instead people need to tackle the bigger question of providing people with cleaner sources of energy. "What we really want to be thinking about is domestic energy, instead of cheap, low-tech solutions that have been shown not to work," he says - a note of exasperation in his voice. He argues that researchers need to find out what drives people to choose the fuel they cook with, whether for example it is cost or availability, and to come up with policies that make clean fuels easily available and affordable. Asked by the BBC to comment on the results of the Malawi study, the GACC said it was not surprised, and would not have expected this stove, fuelled with wood or other forms of biomass, to save lives. "We know that not all cookstoves and fuels can save lives or prevent pneumonia," it says. "We have had an increasing emphasis on clean fuels precisely because we want to maximise health benefits." A number of the stoves the GACC distributes are designed to work with other fuels. But for many of the very poorest people, such as the families Mortimer was working with in Malawi, gaining access to these fuels - such as ethanol, liquefied petroleum gas (LPG), biogas or electricity - is not realistic in the short term. The good news is that the research carried out by Mortimer and his colleagues did suggest the cleaner stove had some benefits, even if it did not reduce childhood pneumonia. Cynthia Katundu, a fieldwork supervisor says families with the new stoves told her that their chronic coughs improved and that family members with asthma suffered fewer attacks. Village leaders also said that nearby vegetation grew better in villages that had made the switch to the cleaner stoves, she says. And importantly, in villages with the new stoves, the study found a 40% reduction in the number of children who suffered burns. During the course of the study one young child was actually killed when a cooking fire took hold and burned down the tiny thatched hut with the child trapped inside. The GACC says this is significant news. Burns from open fires and unsafe cookstoves, it says are "an insidious risk faced by poor households, contributing to a substantial percentage of the estimated 195,000 burn deaths that occur annually". Despite the results of this study by Mortimer and his colleagues the GACC appears set on continuing with its efforts to distribute 100 million cookstoves by 2020. Twenty-eight million had been distributed by the end of 2014 and the figure was forecast to be 63 million by the end of 2016. The alliance points out that the stoves are helpful in many ways, even putting health to one side. Because they are more efficient they reduce the amount of time women and children need to spend collecting wood and slow down rates of deforestation. They also reduce the large amounts of climate-changing pollutants, such as black carbon, released by traditional fires and stoves. Mortimer's involvement with Malawi - where he has been travelling regularly now for four years - is also not about to stop. "The unfairness - that there are people who have so very, very little - that's a big driver for me," he says. His focus now is helping colleagues in Malawi who worked for him to move into new jobs. He has also spent the last few years helping his friend in Blantyre Charles "Godknows" Maseko who runs the Steka home for abandoned street children, and advising him as he turns Steka into a sustainable, self-funding enterprise. And while he admits to "bracing himself" for criticism from advocates of clean cookstove technology , he says he and they share one crucial focus - they all want to clean up the air that the world's poorest children breathe in their own homes. "We all share the fight against this major global inequality," he says, "and the vision and desire to see truly effective solutions."